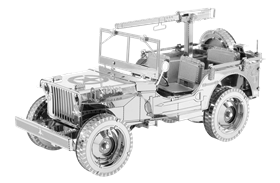 From 1941 to 1945, Willys brand produced 300,000 Willys MB Jeep models for the U.S. Army. This 4x4 utility truck was the original go-anywhere, do-anything vehicle during World War II. Every infantry regiment was provided with 144 Willys MB Jeep models.